NO ENGLISH MEETINGS UNTIL NEXT WEDNESDAY: Shut down. Nightmare. Flu-gate. Just some of the headlines as racing in England is postponed until at least next Wednesday to try to contain the equine-flu outbreak. DUNDALK HOLDING THE FORT FOR THE PUNTERS: But it’s a hassle-free day in the BETDAQ orange, says Daqman, as he opens the emergency rations for an evening out at Dundalk (AW) in Ireland. He naps one trained by the in-form Joseph O’Brien. 5.00 Dundalk The 1-2-3 in a one-mile claimer here in November – Yuften, Hasselnott and Reckless Lad – meet again, setting up a duel between apprentice Dean Curran, who’s had 20 rides in his life, and Irish Derby winning jockey, Seamie Heffernan. Seamie and Hasselnott have just a 3lb pull with which to try to turn around Yuften’s four-lengths advantage, but today’s trip is down a furlong, which should help. Reckless Lad is nine now and looks held from a high draw. He and Art of Unity were both well behind Hasselnot in an earlier Dundalk claimer. I nipped in for a bit of 7.0 Hasselnot in the BETDAQ orange this morning with an easy saver available in the even money or so about Yuften. 5.30 Dundalk Gavin Cromwell, whose last winner was the burgeoning Espoir d’Allen in the Limestone Lad Hurdle, dead-heated here at Dundalk a month back with Nisior Donn, who has failed to score again. But the other half of the dead-heat, Victorious Secret, was victorious two weeks ago, with Nisior Donn only fifth, and has the best chance at the weights today: 6.5 taken on BETDAQ. 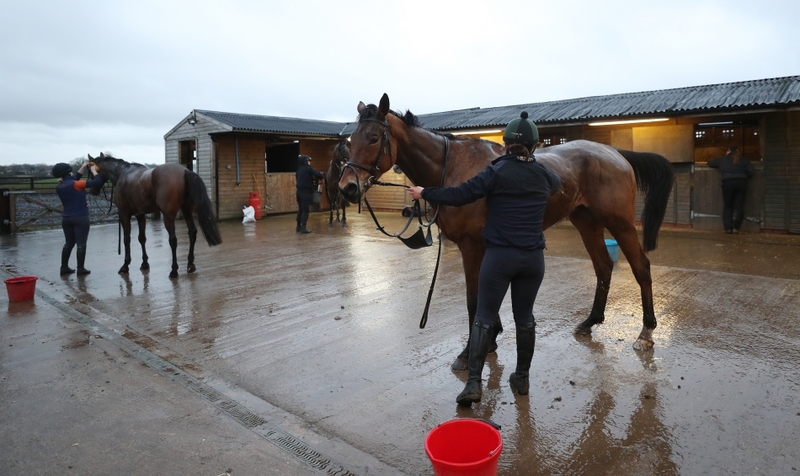 Billyfairplay, who won twice in England in October, and here at Dundalk in December, is up two stone overall but tries to fool the handicapper by stepping up a furlong, unexposed at the new trip. Mick Halford had two winners from three runners here on the first day of the month and his big-field October winner here, 11.0 offer Luna’s Luck, has only 4lb more. Kasbah came within half a length of his first win for two years over the Dundalk CD two weeks back, but trainer Ado McGuiinness remains out of form (0-11 including two losing favourites, which finished third and fourth). 6.00 Dundalk Mick Halford, who won this in 2016, described Sky Seven as ‘a big, raw sort, open to plenty of improvement,’ after he landed a gamble here in December on only his second start with a long run from behind. He was drawn 11 that day in a big field but has the one stall now in what could turn out to be a tactical race, with the in-form Joseph O’Brien saddling two and holding the whip hand for pace. Brother Donnacha is having only his fourth ride of the year (three losers thus far) as he gets the leg up on Colfer Me and Seamie Heffernan partners Numerian. They were one-two in that order a fortnight back over a mile. First -time cheekpieces didn’t win Numerian the races that day (they’re dropped for this evening) and Colfer Me, just a pound worse off, has already won over this furlong shorter trip. 6.30 Dundalk Mick Halford (Gougane Barra) and Joseph O’Brien (The Game Of Life) do battle again here, with the 2017 winner, Admodum, lurking off a similar weight but having changed stables out of the Jim Bolger barn. A good run from Nisior Donn earlier (5.30 race) would boost Gougane Barra, who beat him easily to land the first leg of a double here but, after scoring again on the first of this month, he’s now hiked a total of 16lb, surely a barrier to Barra’s hat-trick. The Game Of Life has started with a win and then a second in better company and the return to a mile will suit; he’s related to Group winners on the dam’s side. I think Gougane Barra may be outgunned here but will return to winning form when stepped up in trip. I could get 2.65 The Game Of Life on BETDAQ this morning. LOW DRAW: IF THE CAP FITS..
7.00 Dundalk Low stalls (5 and under) have won four of the last five of these and favourites also have an 80% record. But the stats don’t fit together! So we may need a short shot and an outsider from a good gate. After showing plenty of pace over 7f and 1m, this drop back to 6f looks ideal for Royal Court (BETDAQ 2.28). The Stack stable had a winner here on the first of the month, and Gatsby Cap (13.5) might be the best outsider. 7.30 Dundalk This is a conditions race which Rashaan won two years ago and is top rated for a repeat after a break. He’s won five times when fresh. Chess Grand Master has just struck form, and trainer Joseph O’Brien (nine wins in the fortnight) couldn’t be in better form. But the handicapper has him 12lb behind Rashaan. 11.30am Jebel Ali: Connor Beasley, Ben Curtis, Pat Dobbs, Royston French, Sam Hitchcott and Richard Mullen. Remember them? They’re jockeys you may have to get used to again if the flu bug won’t go away. All are riding in Dubai today. I’ll have a pound on Sam Hitchcott, piloting Lytham St Annes on the dirt for Doug Watson. Formerly with David Simcock, the six-year-old won here and at Meydan before Christmas.